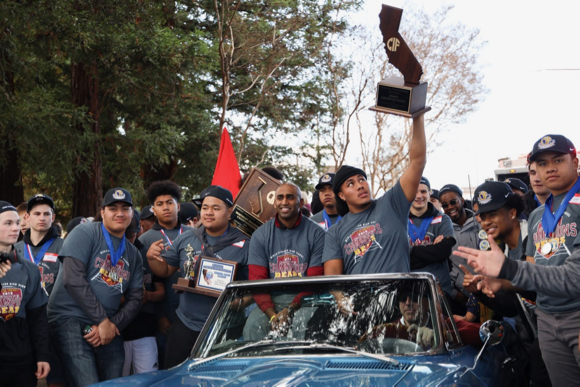 The community turned out yesterday to honor the Menlo-Atherton High School football team which last December became the the first team in the school’s history to win a championship. 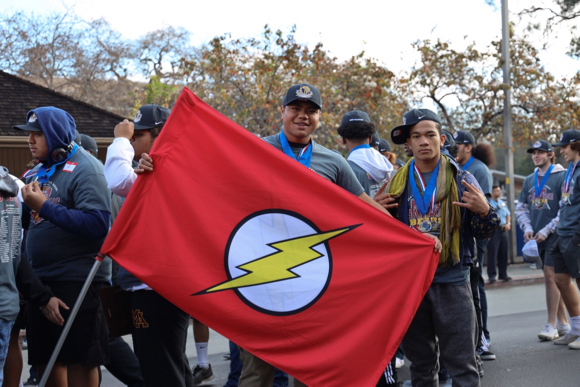 The Bears defeated Lincoln (San Diego) 21-7 to win the CIF Division 3-AA State Championship. Top photo shows team with coach Adhir Ravipati with player Noa Ngalu. 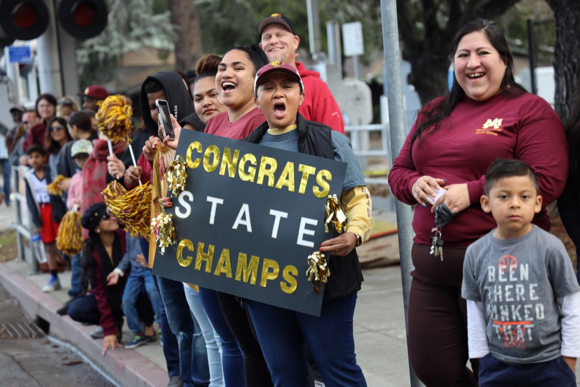 Enthusiastic fans lined Santa Cruz Avenue and cheered the team on as it marched with members of the cheer and dance squads to Burgess Park where school officials and others honored the champs. 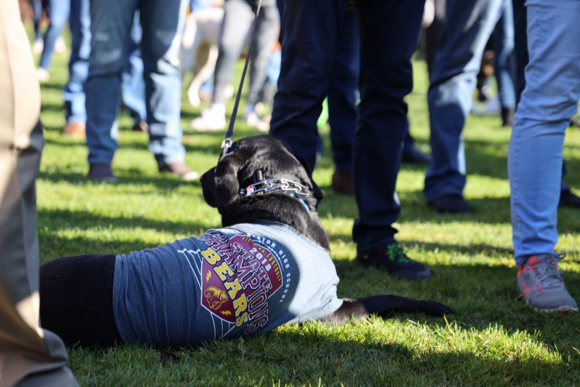 “A good 400 people showed up to parade around the streets of Menlo Park, and to watch from the sides as well. 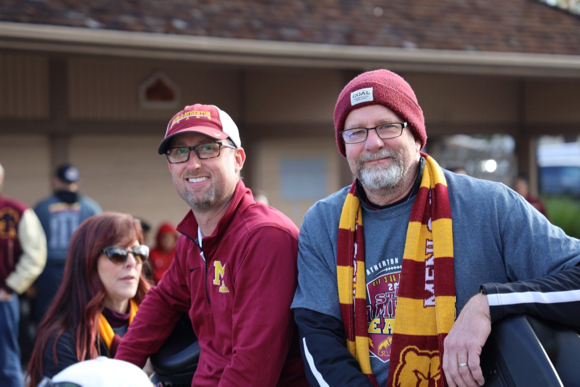 [Menlo-Atherton Athletic Directors] Steven Kryger and Paul Snow (pictured above) road around in a vintage car at the front of the parade, as the cheer and spirit teams guided them up Santa Cruz and then on Burgess. The players were ecstatic. 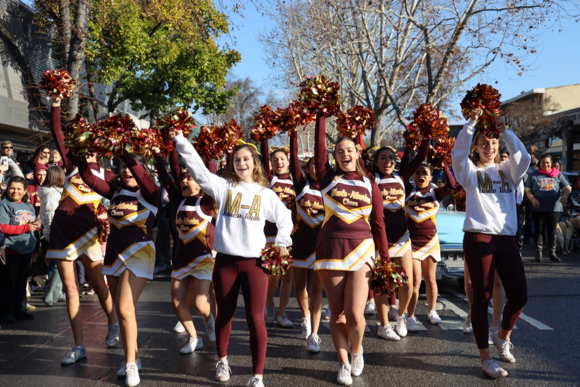 They were just happy to be there and to have the opportunity to celebrate their win with the Menlo Park community. What is with some of the players throwing gangs signs in several of the pictures? Is that a good representation of the school and the team’s victory? Craig, are you a local gang sign expert? or are you just throwing shade, stereotyping these tremendous athletes and fine young men celebrating their pretty spectacular achievement? Maybe do a little research into what photo poses the ‘youngin’s’ think are cool these days before passing judgement. GO BEARS!!! “Throwing shade”, now, who is the local sign expert? que pasa bro? No stereo typing here. No research necessary , just the facts whether the fine young men intentionally behaved that way or not….a projected hand/finger sign is a signal. Period! The “youngin’s” (sp) as you call them should be setting an example, as too what mature persons should be doing and not what the boys are like in the hood!